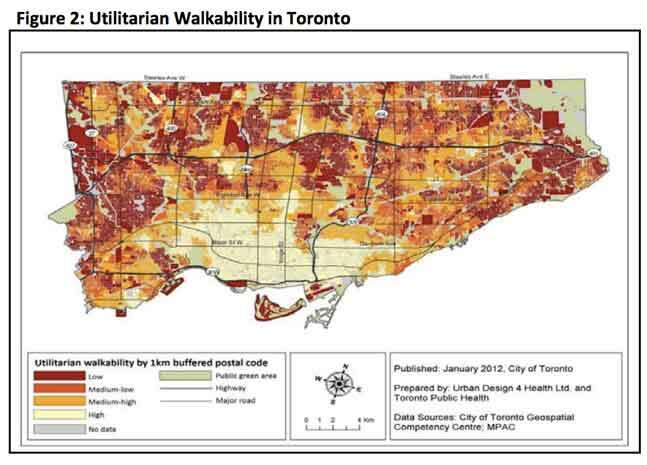 The map above shows Toronto’s walkability, with the lighter portions indicating greater walkability (‘utilitarian walkability” being how easy it is to walk to do utilitarian things — get to work, shop — as opposed to for pure recreation). It’s striking how much high walkability follows the boundaries of the old City of Toronto. There are a couple of additional areas of high walkability in two of the areas designated by the official plan as “centres”, in North York and Etobicoke, which reinforces the finding of a recent study that the “centres” concept is working to some extent. The report finds that even people who are car-oriented will walk more if they live in a walkable neighbourhood — and people who are walking-oriented will walk less if they live in a car-oriented neighbourhood. So urban design does play a role in shaping people’s behaviours, whatever their preferences are.